For those of you who are fans of the older 1950s viewers below are George Themelis's (known as Dr. T) Viewer Books. 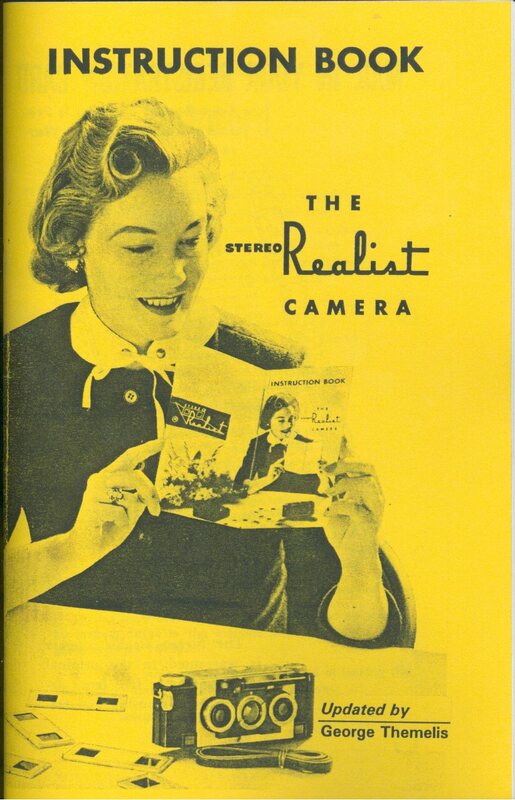 These are probably the most authoritative books ever written on the subject of Realist Format Stereo viewers. They not only include detailed repair and upgrading instructions, but where noted they include replacement parts for tuning up the viewer. The books also detail how to upgrade the lenses, open the apertures to allow viewing of larger format slides and how to replace aged reflectors to allow for a better view of your slides. They also include copies of the original instructions and sometimes copies of the original promotional material. Click on the thumbnails to get a better view of the covers. This details the Green Button viewer which was Realist's answer to the Kodaslide II. It included a DC option and was a total redesign from the red button. It goes over the same issues as the Red Button book and includes a new reflector and a pair of plastic nuts to hold the screws in place. 42 Pages Softcover. 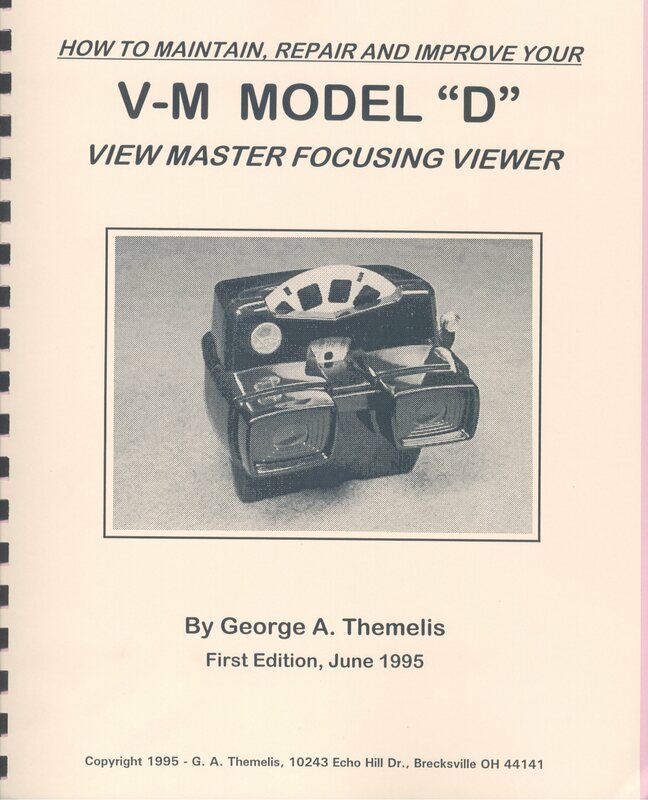 This enumerates everything you wanted to know about the Rolls Royce of View Master viewers. A focusing, lighted viewer with glass lenses it was a higher quality viewer compared with what you can find in a toy store. Due to its many moving parts it needs frequent maintenance and is difficult to take apart and clean. This book goes into detail on the cleaning process along for inspection tips on shopping for a used model. 50 Pages Softcover. 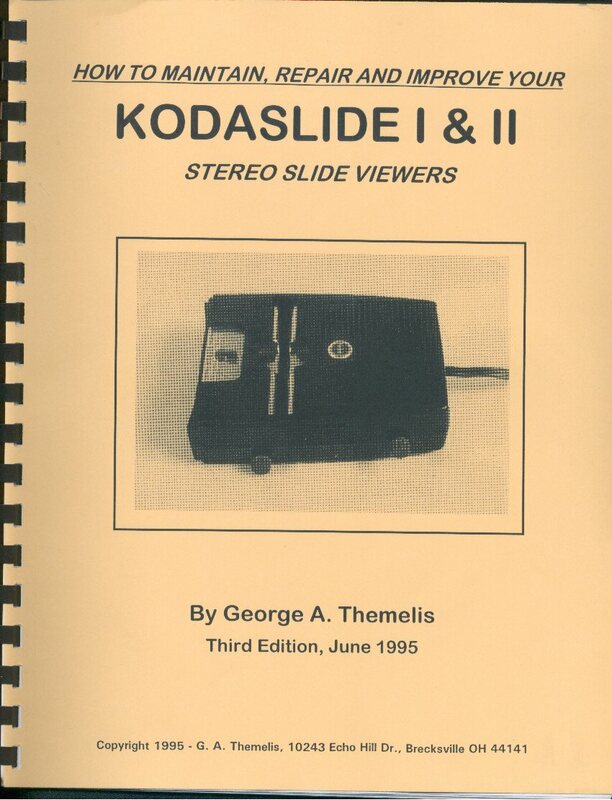 This book details Kodak's entrant into the viewer market, it details both the Kodaslide I which was battery operated and had plastic lenses and the Kodaslide II which had achromats and offered both AC and DC operation. It goes over the often practiced modification of replacing the Kodaslide I's lenses with achromats (def.) and also fixing the problem plagued friction pad focusing mechanism.50 Pages Softcover. This is the book about the camera that started the 1950s stereo camera craze. It is a good starter book on understanding the 5p format and other basic aspects of stereo photography. The Realist camera has a few unique characteristics that are difficult to understand without the instruction that this book provides. This includes the fact that one cradles the camera on your forehead and the loading procedure of the film which if not followed properly can result in a wasted roll. Dr. T adds many relevant annotations in his updating of the book and also includes notes on exposure and a sunny 16 exposure chart. Also included are several relevant articles about the Realist from the Stereogram the Newsletter of the Ohio Stereo Photographic Society.